Fortnite Battle Royale is the new craze that everyone is talking about. It’s a survival video game that doesn’t end until there is a last man standing. People like to compare it to the famous Hunger Games franchise. It’s unlike any video game we have seen. It was released in September of 2017 and is available on PS4, Xbox One, and macOS and Windows devices. The object of the game itself is very simple: survive. This goal can be achieved as an individual, a duo team, or a four-man squad. The game starts with 100 people falling from a bus in the sky, which slowly flows across the map. The player jumps from the bus at any time while it’s over the map. While in the air, the player deploys a parachute, which they can take until they land. The player can choose to land anywhere they please. Some of the popular landing areas are Tilted Towers, Pleasant Park, and Snobby Shores. A cool part of the game that makes it so popular is that every game is a new game. All 100 players start fresh with no weapons other than an axe. It is their responsibility to peruse the land and find any weapons or building material that will help them throughout the game. There are scattered hidden chests, which contain a mixture of health, weapons, and other materials. These items range from common to legendary, with legendary obviously being the most effective. While the battle royale goes on, a storm brews. This storm slowly becomes bigger and bigger. There is a safe circle from the storm that ensures a player will not get hurt from it. If they are in the storm, their health slowly dwindles until they reach the safe area or they die. Another aspect that makes this game so unique is the building involved. Wood, brick, and metal, are the three types of building material a player can find throughout the map. A player can build to protect themself from enemies, build a fortress, or for any other easy way to get around. This game has risen in popularity since it first came out. 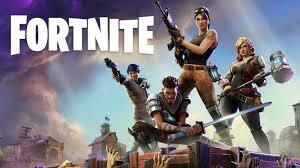 At first, over the PC, Xbox One and PS4 platforms, Fortnite had 60,000 concurrent players. This means that 60,000 gamers were playing at once. In February, they had 3.4 million over those three platforms. One obvious reason for the game being so popular is that it is free. This enables college students and teenagers across the world to enjoy the game while not paying a dime. The crazy thing about Fortnite’s success is that this game isn’t even completely finished. This is “early access” for the full game, which will come out sometime later this year.